Maui is known as the Beautiful Valley Isle. But, after living on Maui for over 25 years, I have a secret pet name for my island home. Let me share it with you – I think of Maui as the Yummy Combo Isle. Yes, the Island of Maui has certain food combinations that were very new to me when I moved here from Chicago. First combination that I love, is a favorite salad that is quiet popular and delicious. It is a mix of Potatoes and Macaroni and is called PotatoMac Salad. 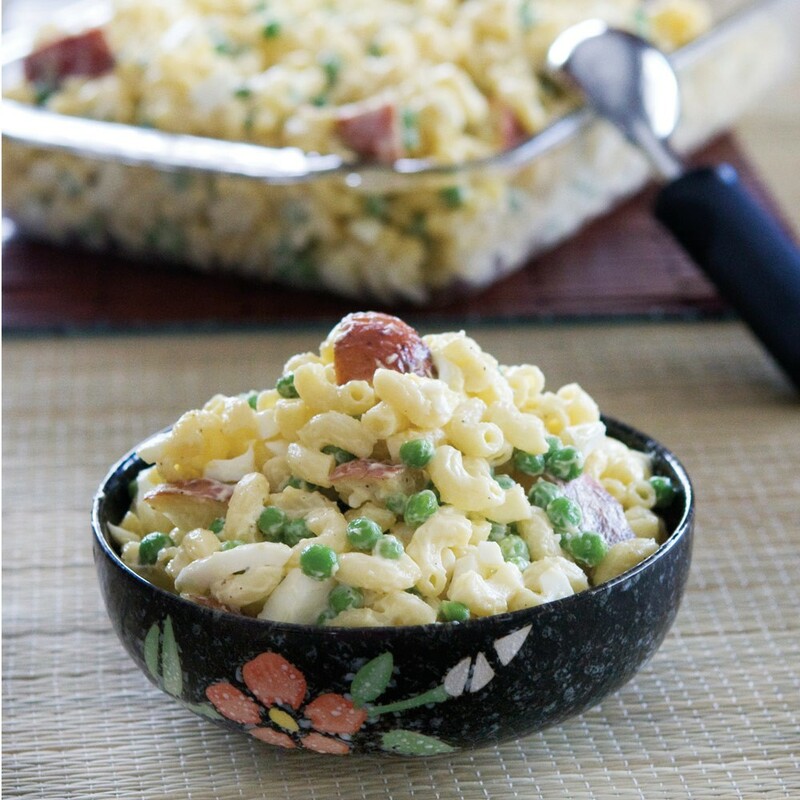 It combines hard boiled eggs, red potatoes, macaroni, mayonnaise, peas, allspice, pepper, salt and vinegar. Sounds a little strange but you must try it when you visit Maui. It is delightful! The second combo that makes Maui Maui is a dish called Loco Moco. A combination of a scoop of white rice, fried hamburger patty and gravy, topped off with a fried egg. This is a very sought after breakfast item and is my daughter’s desired way to start her day. The gravy must be homemade, creamy and dark brown and with plenty of dark brown drippings. If you’re craving to taste this mouthwatering breakfast, be sure to go to a true local restaurant and order off the menu. 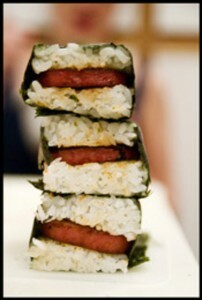 The third combo, little known on the mainland is a Spam Musubi. This is a great snack dish made up of fried Spam, nice and crispy, a small amount of packed white rice, furikake, all stacked and wrapped around with nori. Sometimes for breakfast, this little snack treat includes some scrambled eggs. It is sweet and salty from the soy sauce and sugar mix. You can get this at any minit stop or grocery store. Yummy ! or, as we say in Hawai’i Ono ! I like to enjoy as many as these combos as I can. One of my extra special days might include a Loco Moco breakfast then a great trip out to Hana on the Hana Sky-Trek, and I make sure to pack some Spam Musubi for a snack on the way home!